Human rights of people with disabilities should be incorporated into swedish law! was the message from Denise Crosso, F!s candidate för fullmäktige in Gothenburg when she visited DRW before the Swedish elections and left us with a huge smile. 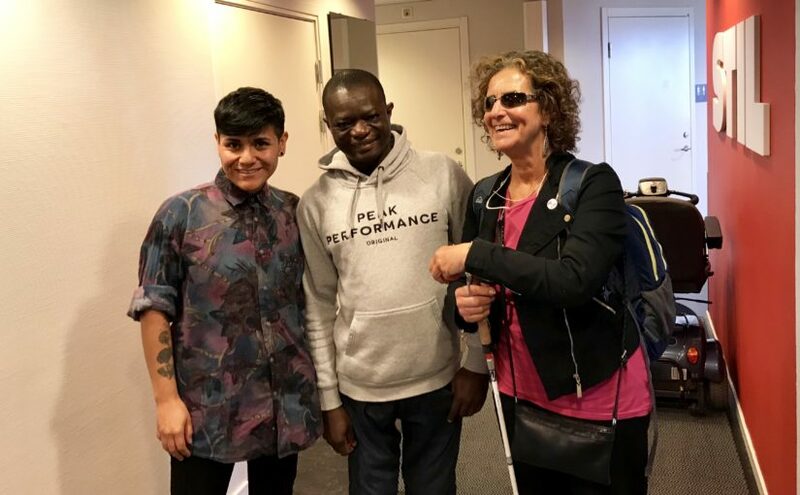 The UN Convention on the Rights for People with Disabilities was ratified a long time ago, Sweden has already tried to follow the recommendations voluntarily but it seems to be a bit impossible. Though it is thought that the Convention is a part of the Swedish legislation municipalities do not take it seriously when the infrastructures and buildings they are responsible for do not follow recommendations. It seems difficult for institutions and some parts of the Swedish society in general to treat people equally. We disabled people meet lots of problems that have to do with the lack of access for disabled children in schools, students at universities, non accessible public transportation and so on, says Denise. Denise Crosso would like to see more disabled people represented in the parliament. Having disabled people in parliament will create more visibility and make a big change in how society should work from an universal design perspective. She thinks that this would then create an impact on how society treats disabled people. Having a job in Sweden is a big part of the culture, it does not take long in a conversation when you first meet someone to be asked the question on work and what one does for a living, says Denise. Still there are so many disabled people in Sweden that do not have access to work. Many disabled people live in poverty all of their life, even here in Sweden, and yet transportation is treated as a cab service which costs too much. It should be part of the collective transportation service and should be for free, she emphasizes. This would allow people to access the society on equal terms. More money to health and support of disabled people than the destruction of societies through war and weapons. Through war people are killed but also injured which contributes to even more disabled people. Denise Cresso as a represent and candidate for Fi wants to create public opinion about Sweden’s weapons export and how this allows for war. It means Sweden is an active actor in warfare as opposed to a peace maker. She says: Sweden should invest instead in the environment through more collective transportation which should be for free. And even more so when it comes to transportation for disabled people so they would in reality be able to access society. Having free public accessible transportation should have people leaving their cars at home and using bicycles instead, she says. Denise Crosso says that when F! looks at people and the disability movement from an intersectional perspective it is seen that disabled women suffer a higher exposure to gender violence due to belonging to two minorities when it comes to power structures. Denise was one of the initiators of the movement #slutvillkorat which started as a follow of the #metoo movement. Slutvillkorat which in english could be translated as “with no conditions” highlights the sexual harassment and violence to which disabled women in Sweden are exposed. Denise explained about the double exposure that women with norm breaking funktionality have to endure when their right for assistance and service for an independent living becomes conditioned. She means that women in this aspect of the power imbalance, as ableism is, become silenced since speaking out in many cases would mean being left behind without protection. Many of the stories told by the women on Slutvillkorat, are stories which have not been taken seriously and with many women not able to speak for themselves. F! finds that DPOs should support disabled newcomers in the same way as Synskadades Riksförbund (SRF) in Gothenburg is doing. SRF started a SFI (Swedish for immigrants) for people with visual impairment. They are working with newcomers with visual impairments to make (SFI) courses accessible so that teaching can be done in using braille. Organisations working with disability issues should support and give information to this target group on how to apply for assistance, what their rights are and even guide newcomers through the swedish social system. LaSSe in Gothenburg is working in this way. LaSSe works in a similar fashion to Bosse in Stockholm. Denise finds that the rehabilitation system should be more accessible. DPOs need to be more organized to push the implementation of the UN Convention and for the establishment of newcomers in sweden. It is very concerning that people with normbreaking functionalities under the asylum process in Sweden probably won’t access the same rights as other human beings and that should be changed. Newcomers with functional variations specifically should have a calmer, more stable and more secure situation in order to be able to start learning the swedish language in braille for example and not be under so much stress, experience so much insecurity and being moved from place to place. Föregående Föregående inlägg: DRW och projektet Den egna berättelsen – om psykisk ohälsa och migration. Nästa Nästa inlägg: DRW är medlem i referensgruppen för projektet -Hälsofrämjande etablering.